Scientific racism is the idea to abuse science to promote racism. This is different from using the scientific method, and simply pointing out differences between races. 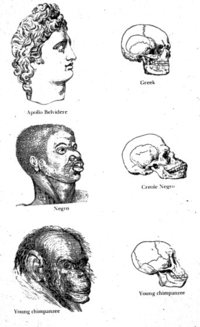 The scientific method does not claim that one race is "better" than another, it may simply show differences between the races. The term was used for some theories of anthropology and other closely-related disciplines. It is possible to use evidence to classify humans into groups. That is not objectionable. Scientists do study mankind, obviously. The claim that one race is superior to another is not part of modern science. Such claims were made, mostly between 1880 and 1930. This page was last changed on 25 March 2019, at 02:48.